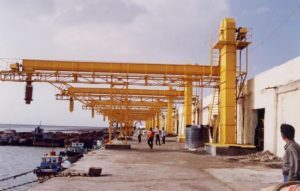 AEGIS offers Systems to mechanize the handling of bulk cargo at Sea Ports. This broadly involves handling of ship loading and ship unloading and barges. Customer centric approach of AEGIS coupled with excellent workmanship and system reliability ensures smooth operation of bulk cargo handling thereby enhancing the cargo handling capacity of companies involved in export and import of bulk material.